The population is three-fold from local residents, summer vacationers and winter residents. The largest and fastest growing population is retirees relocating to the area; many of whom volunteer their time to over one hundred clubs and organizations in Aransas County. Available housing ranges from modest to ultra luxurious residences. Local governments are strong and creative, merging tax dollars on selected projects to reduce costs, merging services and bringing relief to taxpayers. Sport hunting and fishing exists hand-in-hand with fine art, while bird watching unfolds on nature's coastal stage. While the second smallest county in the state, Aransas County has one of the fastest growing populations in Texas. Welcome! We hope to provide a place to quickly and efficiently find county related information. Please do not hesitate to send us your feedback, we would love to hear from you. Thank You. 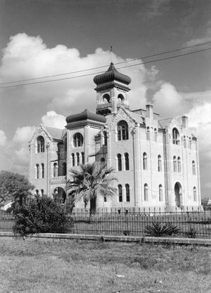 1939 Rockport Courthouse. Photo courtesy of TxDot.